Bailey was the gentlest soul we have ever known. A true gentleman, Bailey greeted everyone with a big Wooo-Wooo. He made friends everywhere. He loved the techs and doctors at his vet's office and they would greet him by calling out "Bailey! ", like when Norm entered Cheers! It always felt like we were with a celebrity. Bailey did much to help others. He was a volunteer donor at the Blue Ridge Veterinary Blood Bank for many years, donating over three and a half gallons of blood. 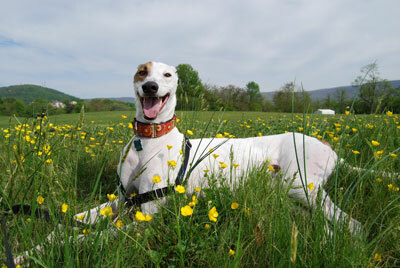 He also volunteered at greyhound adoption events, meet & greets and did home visits for GPA/Maryland. Bailey also possessed a deep-seated love for troublemaking. While on walks, it wasn't unusual for him to grab the heel of your shoe, pop his head through your legs and look up at you, or slam into the side of your leg, just to let you know he was messing with you. 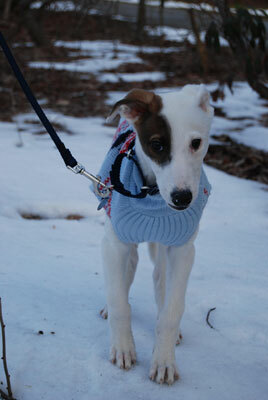 Bailey never raced and was adopted by Joanne and Mike when he was eight weeks old. He was no trouble as a puppy and grew to be the finest of fellows. He left us, too soon, due to kidney disease. He was deeply loved and is greatly missed.